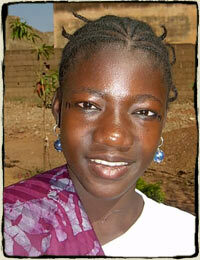 Fatoumata is the youngest at around eleven years old. Her parents came to the city before she was born and shortly after her birth lost her father. She has three older sisters, and a younger sister who sometimes sells peanuts on the street but mostly everyone, including their blind mother, are begging. They sleep in an alcove on the street in front of the grand mosque. Her nephew guides her blind mother while Fatoumata guides other blind elderly and splits her meager offerings with them. She does not remember eating regularly and often they rely on leftovers from people bringing food to the mosque. Only once did Fatoumata receive a new dress for a Tabaski celebration, otherwise, she relied on throw-away clothing from others. Fatoumata is a quick study. She was shown how to use a finishing sewing machine once and not only mastered the finishing work, but knows how to repair the machine as well. She joins a team of three other members to start her own business as well. Her dream is to earn enough money so her mother doesn't have to beg at all.